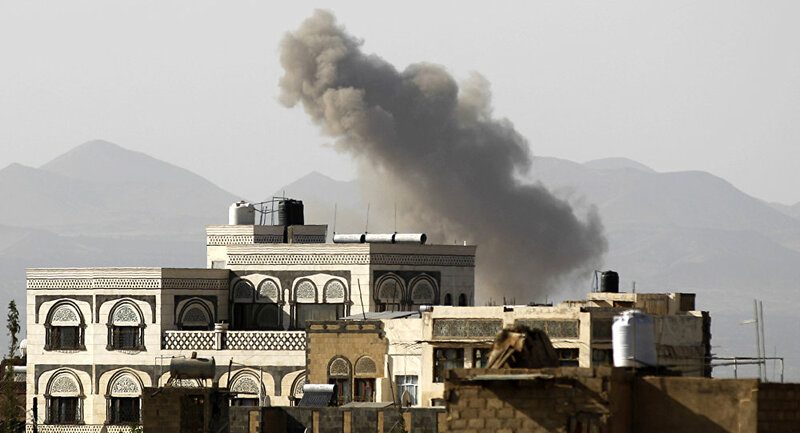 MOSCOW (Sputnik) - The Saudi-led Arab coalition on Saturday attacked Houthi positions in the Yemeni capital of Sanaa, media reported. The Saudi-owned Al Arabiya news channel claimed that among the targets were two sites used by the Houthi movement to store drones. The coalition reportedly attacked several Houthi camps earlier in the day, including the Al-Dulaimi air base. The raids came after Houthis claimed they had downed a coalition jet on the outskirts of Sanaa. Yemen has been engulfed in a violent conflict between a government-in-exile headed by President Abd Rabbuh Mansur Hadi and the armed Shiite Houthi movement, also known as Ansar Allah, backed by army units loyal to former President Ali Abdullah Saleh, since March 25, 2015. Saudi coalition forces armed with US-made missiles and other weapons have killed over 12,000 civilians in the Middle East's poorest nation during their campaign, even as starvation and disease — particularly cholera — have caused hundreds of thousands to become refugees in their own country.